19 books for only #99cent each! If you’ve been wondering about the New Adult category, here is your chance to snag some awesome reads. Nineteen books for under $20.00. Just click the titles below to buy! 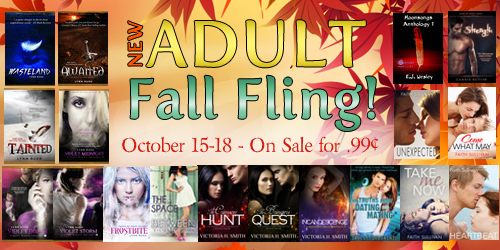 This entry was posted in Announcements and tagged #99cents, #NAFallFling, #NewAdult, Kindle by Lynn Rush. Bookmark the permalink. Great giveaway! I have many of those books already.